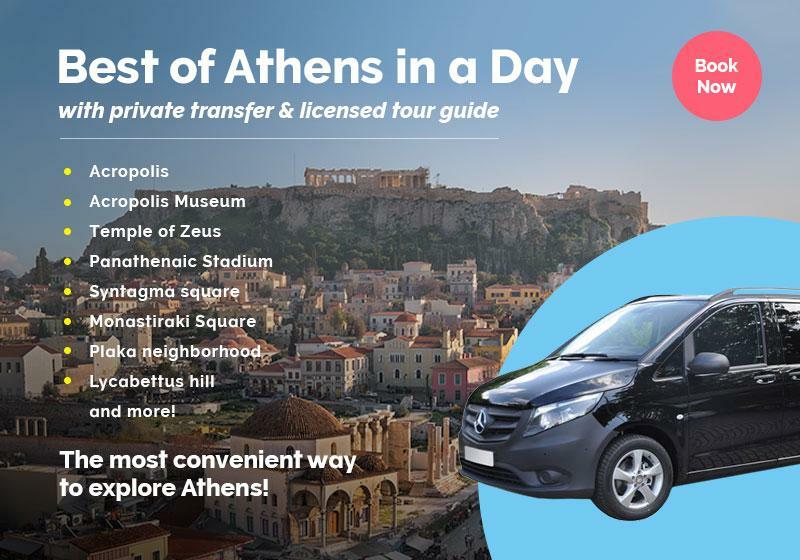 Who wouldn’t want to go on a day trip from Athens to Nemea and taste luscious olive oil, unique vinegar, decadent wines, and indulge in a scenic picnic? That’s right, no one! Explore a less-known part of Greece’s mainland, the picturesque city of Nemea, known for its delectable wine production, and exploit the riches of the Greek land through a wine, vinegar, and olive oil-tasting tour! Additionally, enjoy a scenic picnic in nature, where you’ll taste fresh, organic vegetables and scrumptious Greek delicacies under the glorious sun! Incredible wine, yummy picninc and awsome olive oil-tasting experience! The scerene landscape added to the relaxation factor, and to top it all off the staff was extremely polite. I'll definitely book another tour with Greeking.me next time I come to Greece!!! Let your day-trip to Nemea commence from the comfort of your luxury vehicle, as your driver along with your local, expert guide will pick you up from your hotel, ensuring you get a stress-free, easy and comfortable experience. On your way to Nemea, the first stop will be at Ancient Corinth, where you’ll get the opportunity to visit the awe-inspiring Corinth Canal, the narrow strip of land that connects Central Greece with the Peloponnese, bringing together the Saronic and the Corinthian Gulf. Once you reach your destination, you will take up a luscious Greek olive-oil tasting experience, where you’ll be presented with four different types of olive oil to try, along with slices of fresh, juicy apples that will help you cleanse your palate. Following the olive-oil tasting, get ready to experience a glorious olden-time, province town activity, picnic! Surrounded by the lush vegetation of the Nemean land, you’ll try local seasonal delicacies that will excite your senses and fresh, organic vegetables taken straight from the garden, that are as delicious as they are nutritious. Although Greece is blessed with wonderful weather most days, we’d better be safe than sorry and therefore, in case of rain, instead of a picnic, you will be offered a scrumptious indoors barbeque full of local goodies! On the location of your rich picnic -or barbeque- you will later pay a visit to a Nemean boutique winery and delve into a wine-tasting experience that will include four wines specifically selected for you! Furthermore, you will be given the chance to see the production of different varieties of vinegar and taste some of them in a unique vinegar-tasting experience. Your exciting day trip will come to an end with us returning you to your accommodation fully sated and relaxed. If you’re a wine and nature-lover, this Nemea Wine, Vinegar and Olive Oil-tasting Experience with Picnic will have you spellbound! We CAN provide food substitutions for vegetarians and we can customize the tour to include gluten-free options. Please send us an inquiry we will adapt the tour accordingly! In what language is the 'Nemea Wine and Olive Oil-tasting Experience with Picnic' available? Your good spirits, your appetite, and a camera to immortalize your experience. The rest will be covered by us!